I’m not going to reassure you about this because LIFE IS FULL OF UNCERTAINTY, and we have to learn to live with it. I’m not saying this to be mean, but the truth of the matter is that he could slip on the Minnesota ice outside and hurt himself that way just as easily as a trip to California. We DON’T KNOW. We CAN’T know. All we can do is make decisions based on the evidence available. The evidence available suggests he will be fine. Whether you worry about him or not won’t change anything except for how YOU cope with his spring break. I want to reassure you. But that would be just silly—who am I (who is any mere human) to reassure you of something like this? Our lives ARE like a vapor! We have no way of knowing. The evidence available suggests that most healthy young people live till their 70s, so that’s what I’m going to plan for. My friend thanked me for the tough love; I think I’m allowed to dole it out because she knows about how cognitive-behavioral therapy changed my life. CBT is really just a giant act of tough love, isn’t it? We’re put through torture so that we can barrel through the hell of daily life with OCD. I know I am so glad to have gone through it myself, and that is why I am not willing to reassure someone of something we can’t know. Life is full of uncertainty, and each obsessive-compulsive wants to eliminate it– which is just not possible. Still, we go to great lengths to attempt this impossible feat. Really, our rescue is in learning to embrace the uncertainty. If it boggles your mind a little, that’s okay. It still does mine too, and I’m a success story! For those of you with OCD, is it hard for you to receive tough love from people? For those of you who love an OC, is it hard for you to dole it out? This entry was posted in CBT, friends, OCD, overcoming and tagged CBT, CBT principles in real life, CBT saved my life, cognitive-behavioral therapy, embrace uncertainty, hope in uncertainty, i hate uncertainty, living with uncertainty, tough love, uncertainty by Jackie Lea Sommers. Bookmark the permalink. Needed this today – thanks! Great advice, Jackie! Sometimes I need someone to talk to me with this tough love, and it helps. I am going to talk to myself like this, too! Sounds great, Tina. I have had to do the same for myself. “Is it possible that I am going to hell? YES, it is POSSIBLE. But the evidence available suggests that I love Jesus and am going to heaven, so I have to live life in that light.” Sigh. Oh our minds. Excellent post and great advice for us all, not just those with OCD. “Really, our rescue is in learning to embrace the uncertainty.”..Love this line! Thanks Janet! I find myself having to use these steps with myself and others all the time! “Those things are POSSIBLE … but they are not LIKELY.” It’s crazy how much good it does just to vocally walk myself through this! Tough love is hard to receive, but so, so helpful and NEEDED. Tough love usually spurs me to a more realistic (rather than idealistic/catastrophic) view of things, and getting that kind of sobering wake-up actually makes me feel more hopeful. It’s also good to hear that it still boggles your mind after so much success; I am definitely boggled. 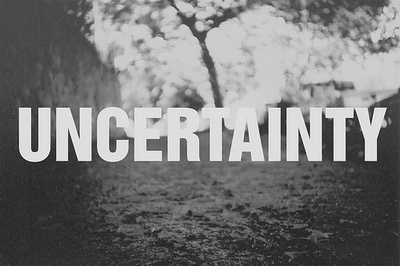 Intellectually convinced of the necessity of embracing uncertainty, but still boggled. I am so glad my post could be helpful! I sometimes find it very difficult not to reassure people– I think it is in my nature to do so! But I know that if I reassure them, they will only be asking the same question ten minutes later. Reassurance doesn’t let the person GET anywhere. It’s embracing uncertainty that does that!